Check the photos above: The one with the pink sign was taken less than a month ago. The one with the black sign was taken last Thursday and given to us by the anti-abortion activist who met privately with West Virginia Sen. Joe Manchin. 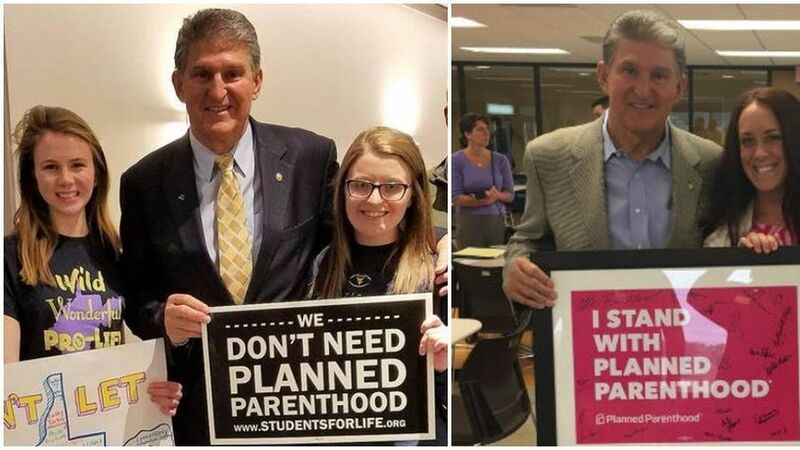 Together, these pictures reflect the tightrope Manchin is walking as a Democratic Senator in a deep red state, who says he's personally anti-abortion but has voted both for and against defunding Planned Parenthood. July 16, 2015: Planned Parenthood president, Cecile Richards, apologizes for the lack of compassion her staff member showed in the secretly recorded video. July 2015: Republican lawmakers repeatedly express horror at the videos and call for hearings to investigate. Planned Parenthood responds that the videos are "heavily edited" and that the costs discussed were for reimbursing the abortion-provider for transporting tissue to research centers. Planned Parenthood says it's never sold fetal organs for profit — which would be a crime. Aug. 2015: Manchin votes to defund Planned Parenthood. He says, "I am very troubled by the callous behavior of Planned Parenthood staff in recently released videos, which casually discuss the sale, possibly for profit, of fetal tissue after an abortion. Until these allegations have been answered and resolved, I do not believe that taxpayer money should be used to fund this organization..."
Late 2015—early 2016: More than a dozen states initiate investigations into the allegations that Planned Parenthood is selling or profiting from baby parts. None of the investigations unearthed such evidence, although anti-abortion activists contend that the investigators didn't use every tool and can't be considered exonerating. Jan. 2016: A Texas grand jury announces criminal charges against David Daleiden and Sandra Merritt, the anti-abortion activists who produced the Planned Parenthood videos. The charges were later dismissed. Jan. 2017, per the Charleston Gazette-Mail: "Planned Parenthood representatives and supporters rallied in front of Sen. Joe Manchin's Charleston office on Tuesday..."
March 2017: Manchin sides with his party to vote against a Republican bill that allows states to withhold funding from Planned Parenthood and other abortion-providers. Also March 2017: California prosecutors charge Daleiden and Merritt with 15 felonies for filming people without their consent. April 2017: Pro-life activists attack Manchin for posing for a photograph while holding a pink sign saying, "I stand with Planned Parenthood." May 4, 2017: Students for Life president Kristan Hawkins meets with Manchin outside a Washington event. He poses for a photo with her team holding the sign: "We don't need Planned Parenthood." Manchin tells Hawkins he voted to defund Planned Parenthood because he was horrified by the videos, but when he discovered the videos weren't real he switched his vote. She told him the videos were real and came away with the impression that if she and her staff could persuade Manchin of that fact, he'd vote to defund Planned Parenthood. Later that day: Hawkins goes to Manchin's Capitol Hill office for a meeting. She brings Daleiden, the maker of the secretly recorded Planned Parenthood videos, and the Senator and his staff meet with both of them. Hawkins and Daleiden both told Manchin and his staff that two forensic reports showed the authenticity of the videos. She said she walked away hopeful that Manchin would reconsider his decision to fund Planned Parenthood. Response from Manchin's office: The Senator's communications director, Jonathan Kott, tells me the Senator will pose for photographs with any of his constituents and that any signs he holds bear no relation to his policy positions. Manchin's position hasn't changed, said Kott: The senator will vote to fund Planned Parenthood because the investigations showed no evidence that the organization was selling or profiting from fetal organs. His support for PP is also contingent on the Hyde Amendment being law, to ensure public funds don't go to abortions. Kott also points out that the only Planned Parenthood clinic in West Virginia doesn't perform abortions. Editor's Note: This post was updated to include the charges facing Daleiden and Merritt in California.